A question I'm often asked (by myself usually) - who would you have most like to have seen in concert? The possibilities are endless - The Beatles (obviously), The Stones, Queen, Led Zep, The Who, Sinatra... But there is only ever one answer. 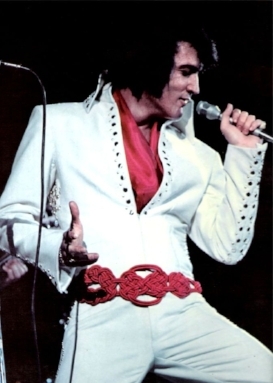 The one person I would have loved to have seen in concert, is Elvis. To be clear, Elvis from 1969 onwards. Elvis in his mature years. Like much of his life story, his last few years have acquired a mythology. The myth is that of a fat, drugged Elvis, bulging belly in a white tasseled sparkling jump-suit, sweating his way through a tired set to drunken middle-aged audiences at The International, Las Vegas.